Historically, the Silver Cup Mining District was explored and developed for high-grade silver deposits. Although lead and gold were of some interest, silver was in demand. The figure below shows the relative value/tonne of each mineral, shown as a pie chart next to each of the prospects in the area. Many of the mines in the area produced ores that had upwards of 300 Oz. silver/ton, and the ore was "rawhided" from the mines to Trout Lake and loaded on paddle wheel steamers that traversed the lake to Kaslo. The St. Elmo mine at Thor was so high-grade, donkeys were used to move ore 8 km down the road through the town of Ferguson, and finally to Trout Lake. There it was loaded in burlap sacks for transport. Zinc (occurring in the mineral sphalerite) was considered highly detrimental, and smelters at the time imposed huge penalties on any ore that was delivered to them that had even moderate levels of zinc. Fast forward to 2017, and zinc is considered a valuable commodity, and even low-grade ore by 1900 standards is considered high-grade ore today! Using modern mining methods, mining companies try to exploit every metal of commercial interest, and this includes precious, base metals and by-products that can be found in minute concentrations in the ore. 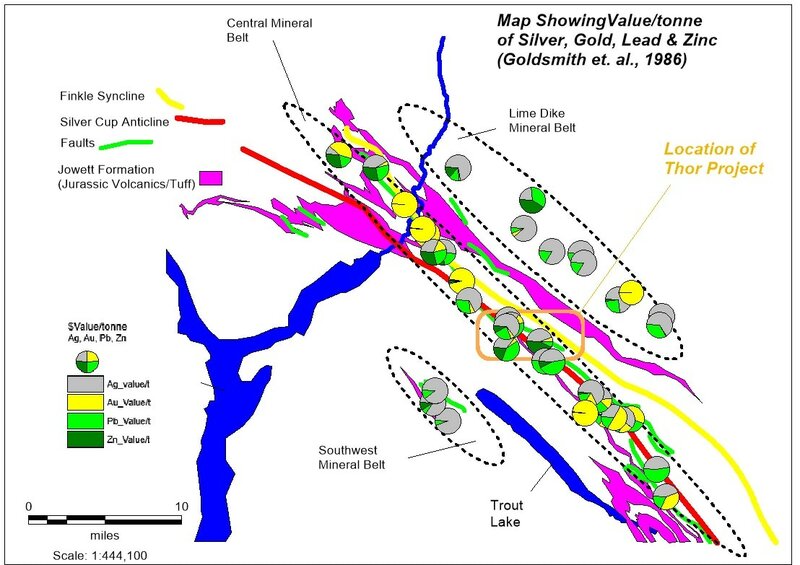 The breakdown of metals in a deposit becomes very important as metallurgy and commercial mining are considered. The metals breakdown can also have a major impact on the how the deposit is mined from an environmental permitting perspective.